WWF India’s hunt for the Youth Tiger Ambassadors is now over as it introduced to the country, two progressive minded youth to represent India at the upcoming Youth Tiger Summit at Vladivostok in Russia. These Young Tiger Ambassadors will represent India at the Youth Summit which will be held parallel to the International Tiger Forum which is being hosted by the Russian Prime Minister Vladimir Putin from 21-24 Nov in St. Petersburg, Russia. The International Tiger Forum will be a one of its kind high level government meeting on tiger conservation. The Tiger Forum will discuss the global action for the conservation and rehabilitations of tigers across their range. It promises to be the most significant meeting ever held to discuss the fate of a single non-human species. As of now, we know that saving the tigers requires a ”Preservationist” approach. Regional planning is important around tiger reserves to foster ecological connectivity between protected areas through integrated planning. Importance of this magnificent species and its future conservation strategies will be discussed at the international forum. The selected young ambassadors from India will take forward the urgency for action in the parallel Youth Tiger Summit. Mr. Ravi Singh, CEO, WWF-India noted in his opening remarks that, “Holding a youth summit alongside the International Tiger Forum will be conveying the voices of the younger generation to the world about the fate of these magnificent cats.” The Youth will be emphasizing the importance of tiger conservation, its challenges and a vision for the future at the meet. So, the ultimate aim of the youth summit of ”educating the young generation about the facts and involving them to help solve the problem” will certainly be fulfilled. 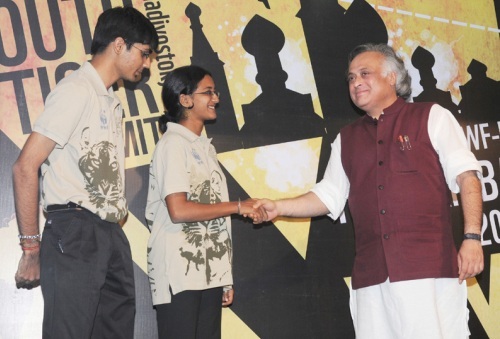 Before the Youth Ambassadors embark on their journey to Russia, both of them signed a pledge of support to the cause of tiger conservation in the presence of ­Hon’ble Minister for Environment and Forests, Shri Jairam Ramesh. It is indeed time to save the tiger paws, before nature destroys us with its paws. I was one of the ambassadors- I would like to point out that my name does not have a k- it is Anusha Shankar. Thank you! And of course, Save the Tiger!